Most landscaping contractors would agree that word of mouth advertising is the most effective way to grow your green industry business. Online reviews are now a new way to spread the word about your contracting company. Remember, it’s important to get reviews, so your sales prospects trust you as well as hire you for their landscape contracting needs including lawn sprinkler system maintenance. 1. Belong to different review websites: Register your site with Yelp, Google Your Business, Facebook and the Better Business Bureau to pick up more reviews. 2. Ask your customers for a review when you finish a sprinkler job for them: When you complete a project for your customer, ask them for a review. Better yet, email them with the links to review sites so they can click and go right to the website. You’ll get more reviews when you make it easy for your customers to click and respond. 3. 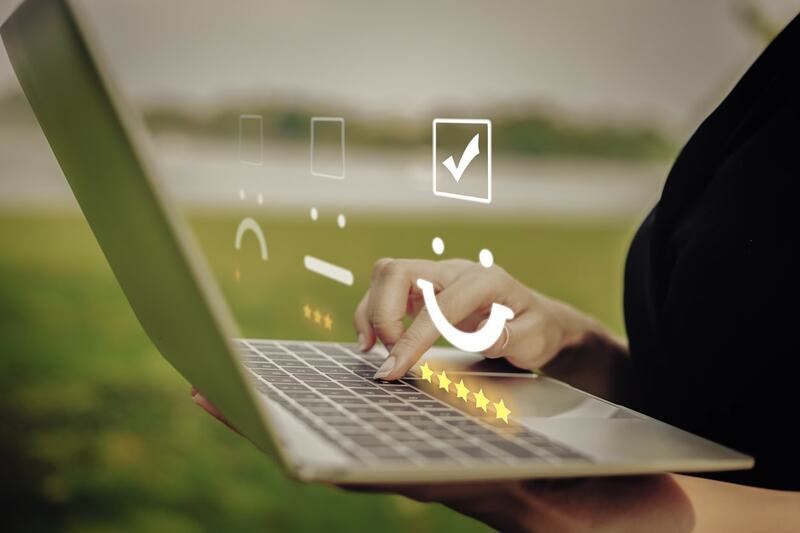 Keep your website optimized for reviews: Make it easy for your customers to click on review site badges right from your website. You can also remind your customers to leave you a review on your website by providing those links in an e-newsletter or by contacting your customers directly. Learn how to become a certified irrigation contractor by reading this blog post. 4. Survey your customers’ experience: Use a survey program to send a few questions to your customers. Remember, they’re busy like the rest of us. So, keep your questions simple with multiple-choice answers. You can also ask one or two open-ended questions for your clients to explain their answers. 5. Reply to the positive as well as the negative reviews: It’s crucial for you to respond to every review. If you get a negative review, give yourself some time to gather your thoughts. You don’t want to argue back or blame the customer. Instead, you want to give a response that shows compassion and understanding. HubSpot has some great examples. Read more: 8 Benefits of K-Rain’s Rotary Nozzles for Residential Sprinkler Systems. 6. Use your newsletters to garner more reviews: When you prepare your monthly newsletter, make sure you include a space with links or badges, so your customers to leave a review for you. You can direct your customers to evaluate different parts of your service or comment on a successful project you did for them. 7. Be mobile-friendly: We’re a mobile-loving world. People look up and schedule home services through their mobile devices. Make sure your website is mobile-friendly so your customers can leave you a review on the fly. 8. Motivate your customers to leave a review: Giving away gas cards or gift cards to Amazon or Starbucks can be expensive. Why not be practical? Motivate your customers to leave a review for you and give them a 10% off coupon for their next sprinkler system service. You’ll be giving them something from your business rather than a generic gift card to a popular retail outlet. K-Rain is looking for certified irrigation contractors. When you partner with us, you’ll be connected to a world-class sprinkler system manufacturer. You’ll boost your reputation and accumulate more reviews for your landscaping contractor website when you join us at K-Rain. We’re a well-known brand in the sprinkler system industry. If you’re interested in installing and maintaining K-Rain sprinkler systems, then join our Premier Contractor Program today.